Part 5 in our 2018 Influencer Marketing Strategy & Planning Playbook series. Start by reviewing known (i.e. previously engaged) influencers, advocates, referrers, loyalists from past campaigns or existing resources, such as subscriber lists, CRM database, and social followers. We recommend leveraging an IMR Technology Partner, such as Mavrck, to manage your relationship and performance data for each. Biographical & demographic information for identification: What do we know about the influencers already? How do they self-identify? Conversation indicators for Identification: Are the influencers discussing relevant topics online? If so, what are they talking about (likely using a IMR Technology, such as Mavrck or social listening tool)? Destinations for Identification: What are specific locations where they can be found? It’s important to vet an influencer’s content for negative or risky content, as well, to manually review their presence for brand alignment, e.g. does their aesthetic match that of the brand, and does their tone fit the campaign and brand messaging? Influence is rooted in historical social behavior and predictive brand performance – an influencer my be relevant for the next few hours or perhaps for years, which requires technology to understand and quantify. Mavrck’s Curation module allows you and your teams to ‘upvote’ and ‘downvote’ influencers based on your influencer identification parameters, influencer percentile and performance. 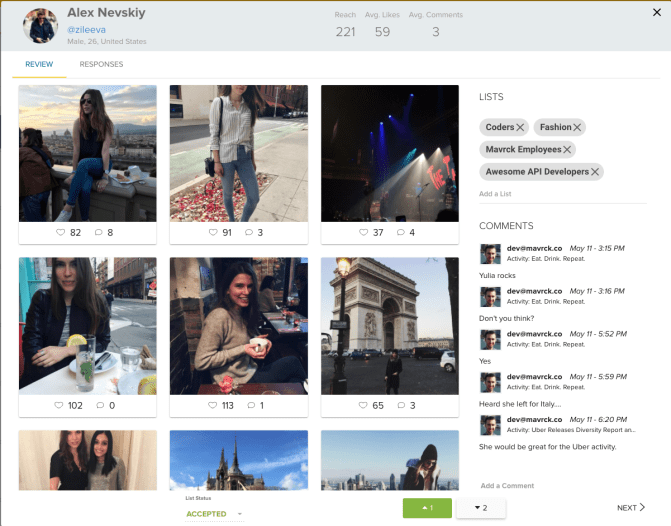 Mavrck’s Influencer Review module displays a gallery of that Influencer’s last 25 posts, as well as the likes and comments earned per post. During the review process, you or any member of your team can leave notes on influencers’ profiles, and will be maintained across any subsequent interactions with the influencer. 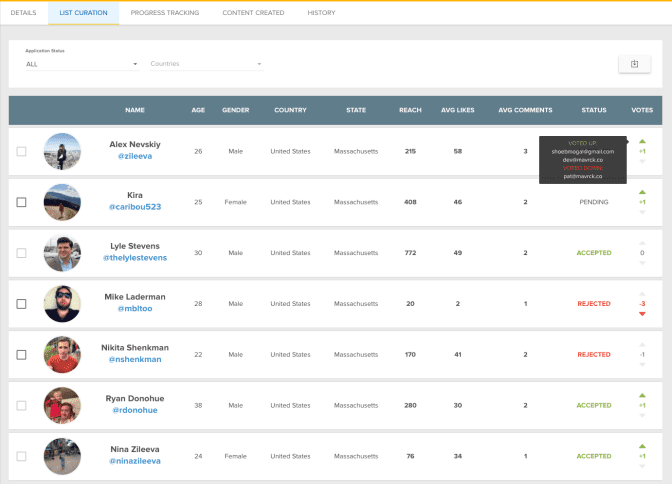 You can also tag and segment influencers into specific lists.